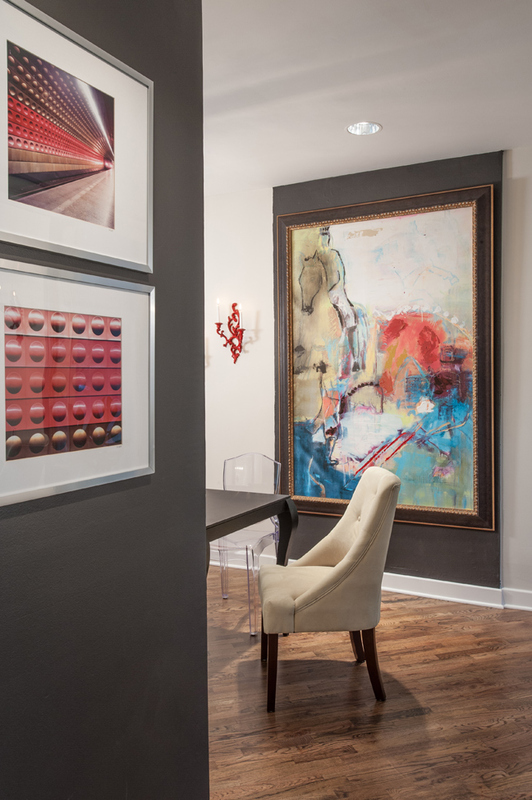 Designer Garison Salinas and his clients collaborate to create a highly versatile living environment. Swivel chairs, covered in Robert Allen fabric, flank the gas fireplace with its shimmering crushed glass fuel bed. Salinas transformed an unwiedly structural bump-out into a perfect setting for the large, gilt-framed abstract that dominates the dining room. An "icicle" chandelier with crystal drops is suspsended above the formal dining table, and photos of Holland's art-filled subway walls are displayed on a black accent wall. Sleek leather seating emphasizes the lounge-style ambience of the living room, an organic coffee table, handmade by the husband, provides interesting contrast. Inspired by boutique hotels the owners enjoy when traveling, the master bedroom features a custom vinyl headboard with platinum python finish, low-profile nightstands and a deep-pile New Zealand wool carpet. The modular chifforobe, from Resource Furniture in Manhattan, houses a coffee-making center. 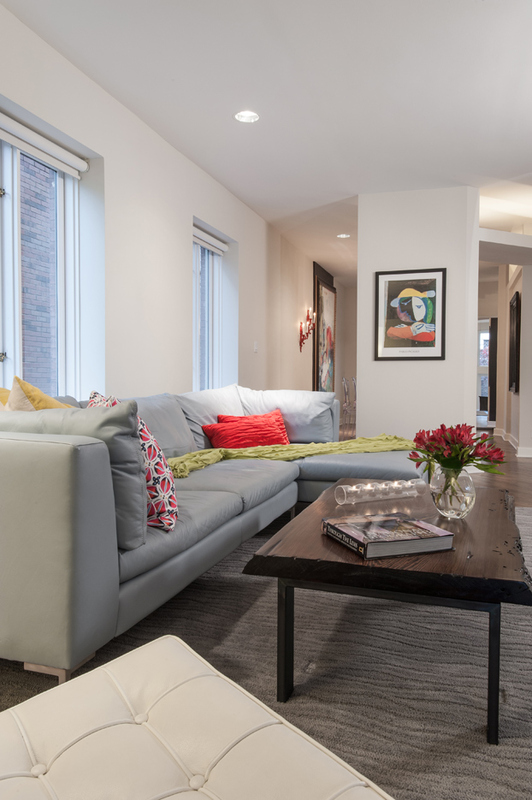 While that may be a slight exaggeration, the couple’s search for a vibrant downtown lifestyle began almost immediately, and two years ago they zeroed in on a classic urban townhouse set on a quiet street in the heart of the CWE. Originally a four-family residence, the building was constructed in 1905. 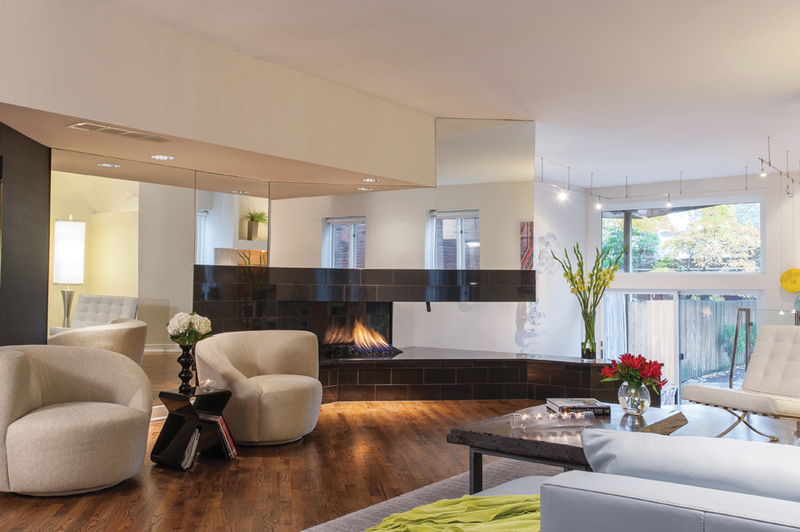 Decades later, two of the units were purchased by the head of Washington University’s architecture department, who converted them to a single multi-level home with a distinctly modern flair. Subsequent updates were made, as well, and a key attraction for the current owners was the townhome’s fenced backyard patio, which features a fountain and recumbent lion-with-ball sculpture – a prototype by St. Louis legend Bob Cassilly. Downsizing from a 4,500-square-foot family home to a 2,700-square-foot townhouse required considerable planning, and the couple decided to start from scratch, saving only a few special items from their previous residence. The choice of a designer was never in question, though. For several years, the husband had enjoyed a professional relationship with Garison Salinas, architectural design consultant and principal of Garrison Ltd. “Garison was involved from the beginning and provided the ideas,” he states. 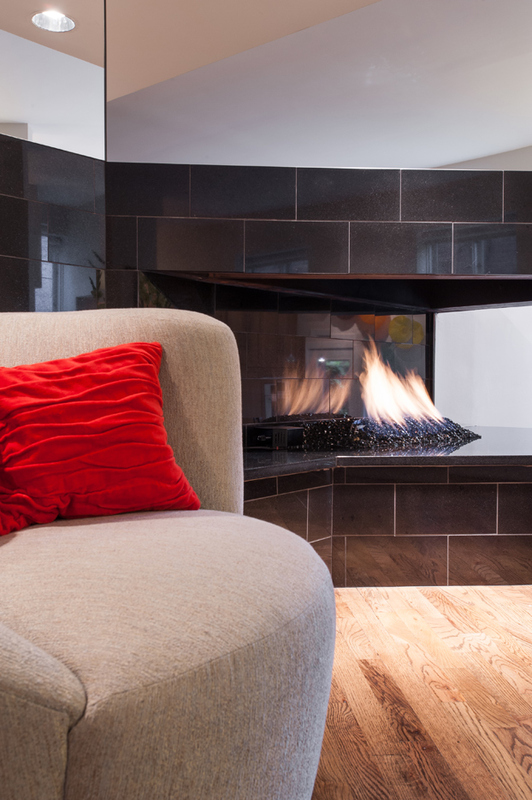 He describes the décor as “California coastal,” indicating the main-level living room, which is designed for comfort – “cleanable, kid-friendly and more like a lounge area.” The uniquely angled fireplace was converted to gas by Gas Appliance Service, with flames emanating from a bed of crushed black glass. The brick surround was replaced with gleaming expanses of absolute black granite tile from Kirkwood Flooring, who also refinished the main level’s diagonally laid white oak floors and installed all-new flooring in other areas. 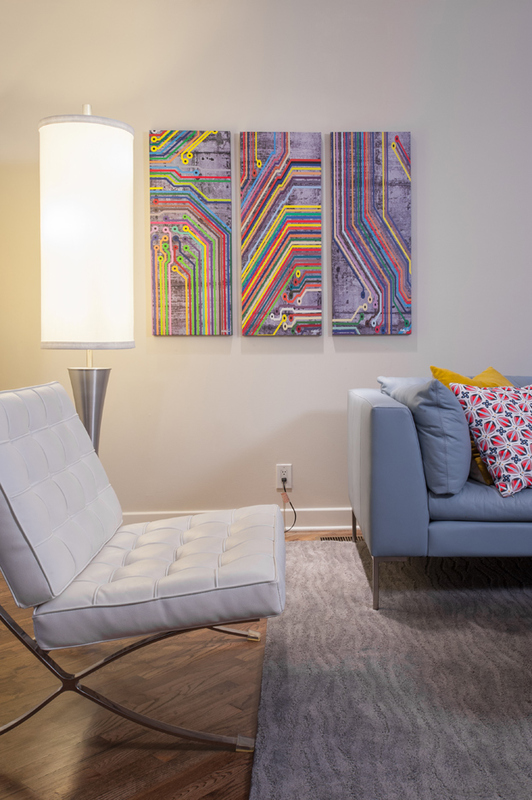 Walls were mirrored by County Glass to enhance the space, and sleek leather couches and swivel chairs, all locally acquired, provide plenty of comfortable seating. The formal dining room is a case in point. Found online by the wife, the expandable table has an easy-to-clean, inked oak matte finish and graceful, cabriole-style legs. With their classic shape and transparency, the acrylic dining chairs are reminiscent of the iconic Ghost chair and make the room appear larger, while soft-green ultrasuede host/hostess chairs add color and contrast. “The design gods worked with us in this space,” Salinas laughs, referring to the massive painting that set the tone for the dining room. An early find, the rich-hued abstract was a perfect fit for a structural bump-out that would otherwise have been visually distracting. On the opposing wall, Ralph Lauren-inspired metallic grasscloth from Reineke Decorating Center lends a subtle sheen, and a large mirror reflects the painting. Fully open to the living room, but on a lower level that accesses the patio, are the casual dining area and kitchen. 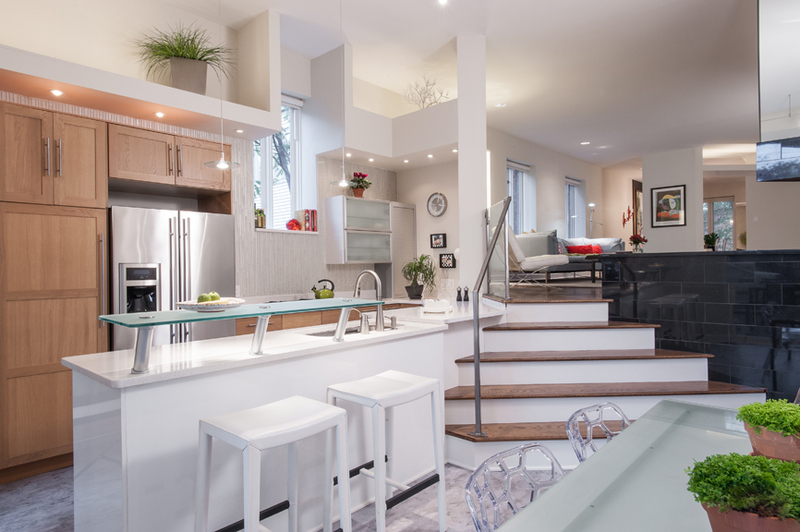 Already equipped with stainless appliances and stylish contemporary cabinetry, the kitchen required only a few modifications, including a glass tile backsplash installed vertically to emphasize height. A custom glass shelf was added to the existing work island, and an array of large glass serving pieces from Mexico, cleverly arranged on one wall, creates a dazzling splash of color. Informal meals are served on a streamlined table, topped with frosted glass and surrounded by another set of clear acrylic chairs. 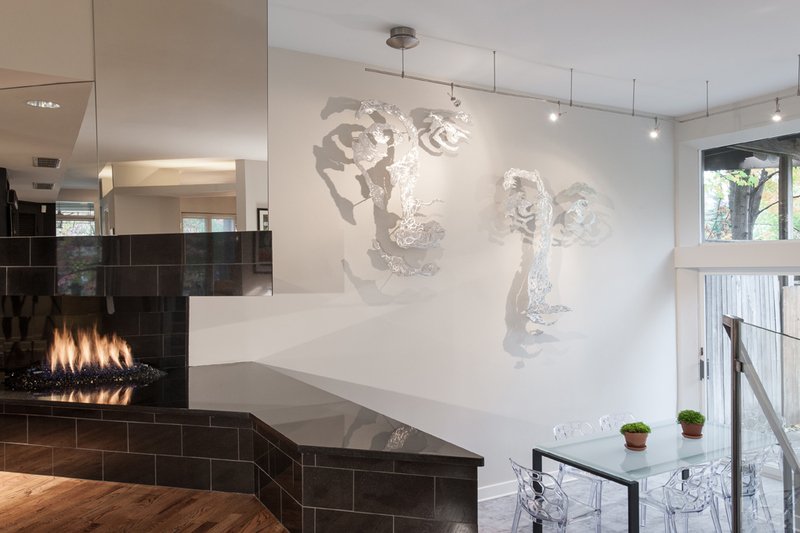 An abstract metal sculpture by Jay Behrle from the owners’ private collection is prominently displayed overhead. 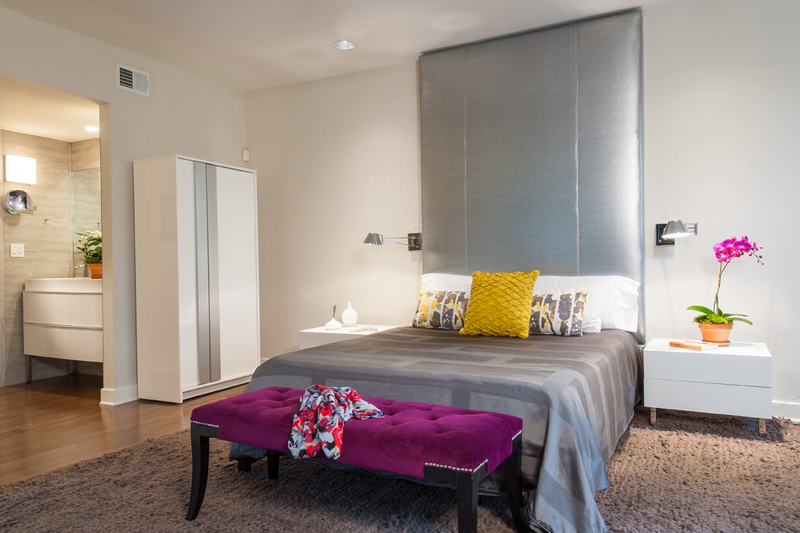 Blurring the distinction between interior and exterior spaces is a hallmark of Salinas’ design, as illustrated by the surface treatments in this area of the townhome. The interior flooring, Centiva solid vinyl tile, merges seamlessly with the stamped concrete of the backyard patio, which was constructed by CLC Construction and features a heated walkway. A custom railing by Perpetua Ironworks accents the steps leading up to the living room, and absolute black granite blankets the half-wall, creating a smooth visual transition to the fireplace. Another custom rail and metallic grasscloth line the staircase to the second-floor privacy level, and an eye-catching framed scarf purchased by the owners on a trip to Amsterdam embellishes the landing. Lit by a huge skylight, the upstairs hall continues the industrial aesthetic with frosted glass doors, square stainless knobs, and Emtek lock and pulls. Renovation of the master bedroom started with removal of the existing potbelly stove. Salinas chose to “neutralize” this entire wall with black paint, providing a bold background for the entertainment center and caviar-colored bookshelves that display the owners’ personal memorabilia. Similarly dramatic, the boutique-hotel-inspired bed has a one-of-a-kind headboard, more than five inches thick and covered in platinum vinyl with a python finish from LuLu Belles. The headboard’s silvery sheen is repeated in the geometric-patterned bedspread, and a classic orchid bench and pops of citron yellow in the occasional pillows add vivid color. Wonderfully tactile, the deep-pile carpet is cappuccino-colored spun New Zealand wool that literally massages bare feet. Completing the look are low-profile nightstands, chrome reading lamps, and a modular chifforobe that disguises a complete coffee service center. 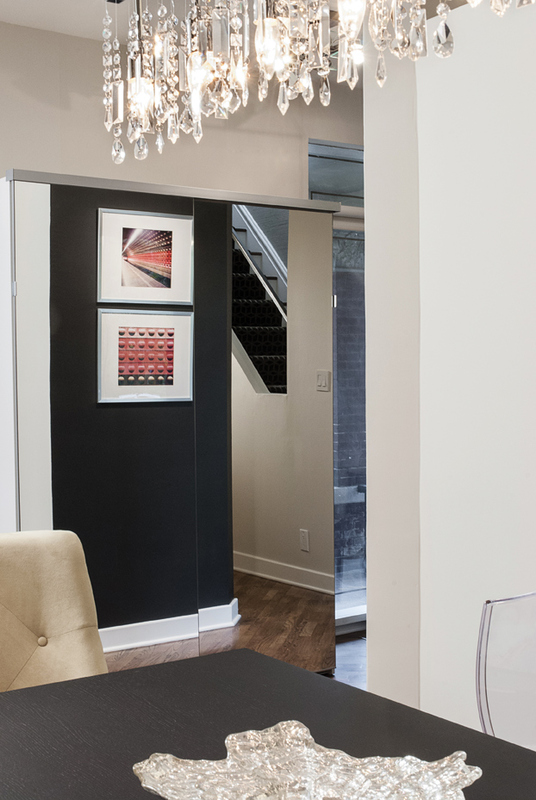 The adjacent walk-in closet is European-styled and open-topped, with the wall stopping short of the ceiling. 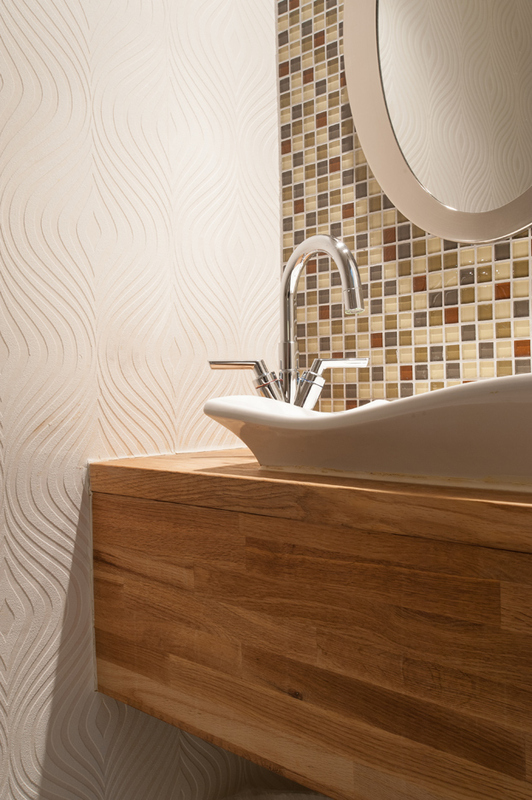 And in the master bath, glass tile surrounds the double-bowl vanity with its stylish Dornbracht fixtures. Fashionable and incredibly versatile, this contemporary townhouse is a prime example of Salinas’ ingenuity and design skills. 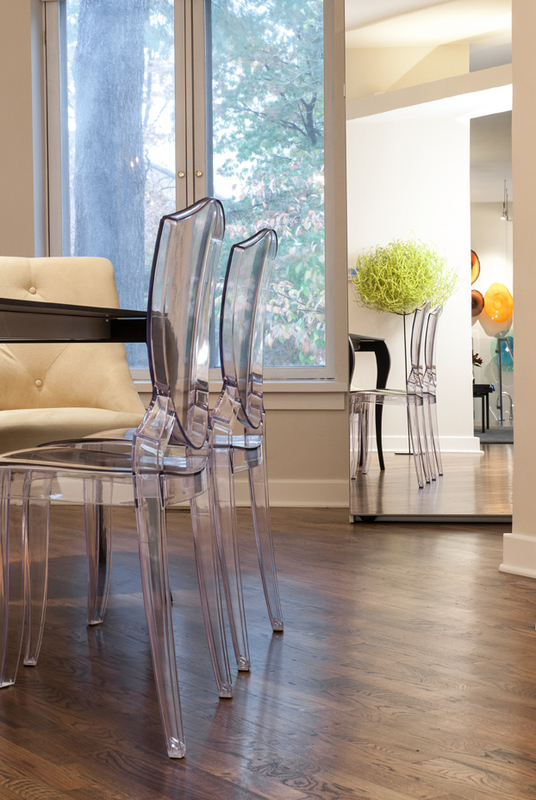 For the homeowners, it’s an elegant urban sanctuary – the fulfillment of their long-held dream.